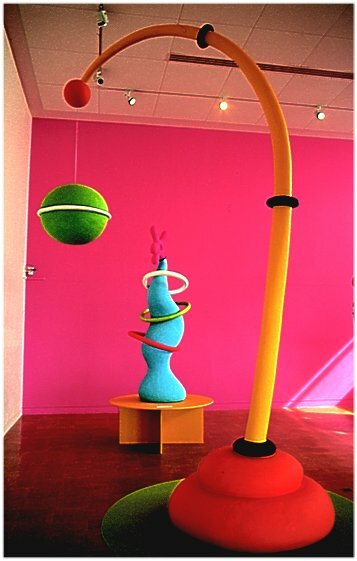 In 1999 we were asked to do an exhibition at the De La Warr Pavilion in Bexhill. We loved the space with its lightness and breezes blowing in off the sea. 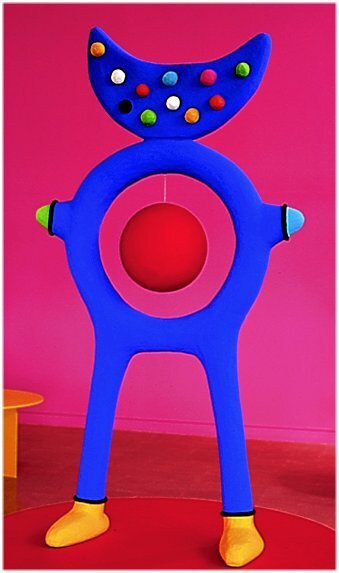 We had been going to the circus a lot and wanted to make some sculptures that had something of the movement, colour and excitement of the acts that we saw. We wanted the sculptures to work individually and as a whole and decided to paint the walls of the room pink as a background for the colours). This created some great colour combinations as you looked through the sculptures when walking around the space. We made some of the pieces able to move and sway in the breeze. Our friend John Davies wrote this for the exhibition catalogue. 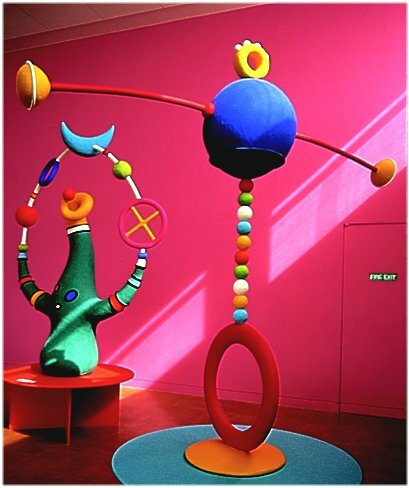 “Christopher Rutter and Evelyn Bennett make sculpture in co-operation – a double act, common in the world of entertainment; but not in the world of art. Eliminating the restrictions of a single obsessive ego they produce work out of a complimentary partnership of ideas and sensibilities. 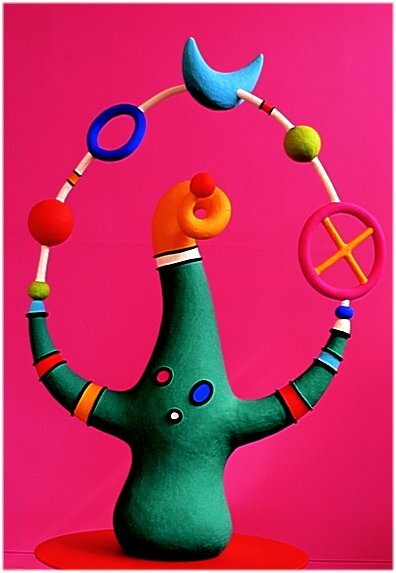 They combine their different skills from the backgrounds of sculpture and design to create these playful euphoric sculptures where colour and form play equal roles, as in nature. The spirit of the work is in cheerful opposition to the English character – here is the parrot not the sparrow. There are acknowledged echoes of journeys in Africa, Spain and Mexico – painted houses, brightly coloured carvings, toys, sweets, pottery and textiles, budding plants, cacti, animal and marine forms and above all, the circus; all for our enjoyment and delight. The circus has caught many artists in its spell from Degas to Calder. The risk, colour, suspense and sheer theatricality attracted even D. H. Lawrence from sombre Eastwood, Nottinghamshire and later Mexico. 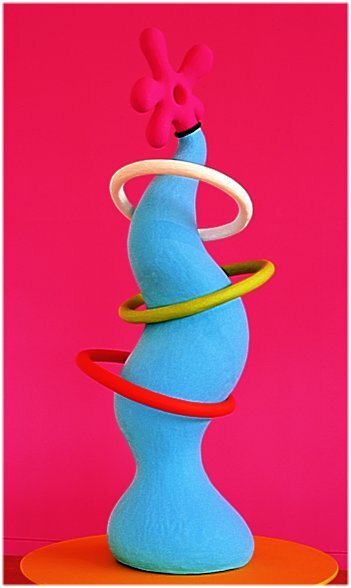 The use of colour and form together is a neglected area for sculptors. Such colours as used in these works are unusual and vibrant – particularly noticeable in a Britain whose colours are mostly those of the grubby pigeon and when it is fashionable to wear black and muted colours. Our attitude to colour is still Victorian and reserved, we are afraid of its sensuality. The brightest colours are those red post boxes against green fields. The red bus on a grey street, the pink of a colour-washed cottage. We British keep the brightest colours fenced in our gardens. Experiencing the work one wonders why our buildings aren’t coloured to combat the rain soaked concrete hues favoured by our architects. Colour and decoration and sculpture are absent on buildings and in our cities where they are most needed to compensate for the lack of nature. We have long winters and grey streets – colour and sculpture could be let loose. The artists have created, for this most English of resorts, a colourful exotic ‘garden of delights’ which also contains the shapes and feel of the circus. 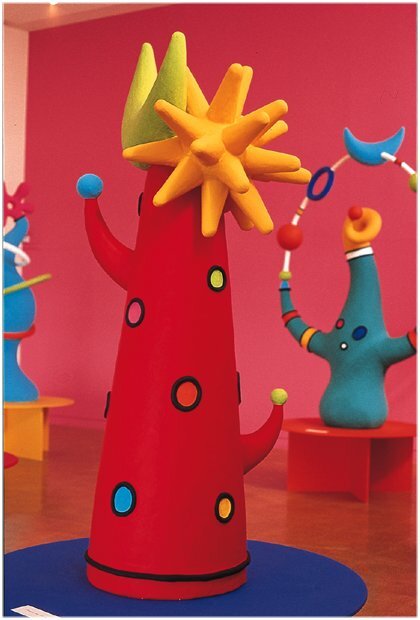 Here we can find the juggler, unicyclist, tight rope walker, and vibrant colours used lavishly and joyfully. Here the parrot to confronts the sparrow, the Mediterranean meets the English Channel.